Location, location, location; and no, it’s not the real estate that’s got me waxing bromidic, it’s the spreadsheets, of course, and those recurring second thoughts about how their data are conveyed, and exactly how and where they’re…located. The data here clamber about eleven scarily similar sheets, strewing price and sales volume numbers across the 33 London boroughs (they’re counting the interstitial City of London as a borough here). And while the data are readable, are they usable? That is, can you do something with them? Delete the vacant row 2. 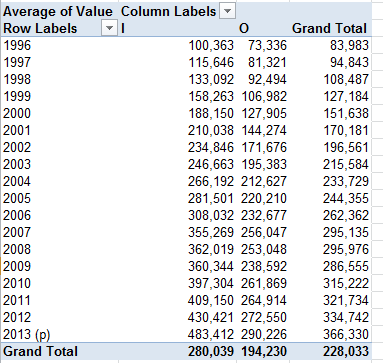 Consider this: because the restructuring espoused in the August posts trisects the data into Row, Column, and Value fields only (which in turn are cast into a three-legged, or field, Excel Table), and because it is invariably the leftmost field in a data set that resets itself in Row terms, the Area field text data will assimilate into the Column field, even though its borough names are not of a piece with the numeric year data. What you could do, then, is simply delete the not-terribly-meaningful Code field, thus vesting Area – now the leftmost of the fields – with Row status. 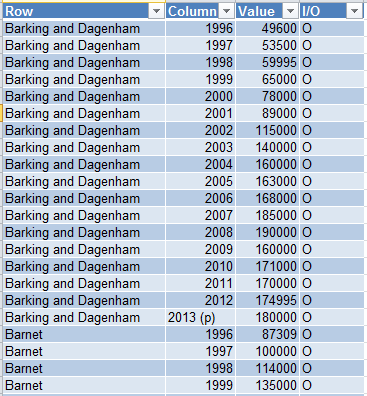 Earmark only A1:S34 for the pivot table-eligible makeover, that is, just the London borough-identifying rows. The summatory data beneath row 34 communicate different kind of data. It’s also occurred to me that once you’ve submitted the data to the above process you could march on and develop pivot-table breakouts along Inner-Outer London lines, as per the aggregated Inner-Outer mentions in the lower reaches of most of the sheets and which won’t appear in the pivot tables we’ve commended above. (For a detailing of the Inner-Outer borough opposition see this piece. There is, by the way, a dispute about where the borough of Newham goes.) So once you’ve forced the data into the Row, Column, Value triumvirate you can then add a fourth field (say, called I/O, and that’s a not a computer throughput allusion) stocked with borough Inner-Outer identifiers. Tables being tables, the formula automatically writes itself down the D column (the [@Row] syntactical bit is how Tables express a cell upon which you’ve clicked, instead of the standard A2, for example. They’re called structured references, and aren’t quite a day at the beach; see a Microsoft discussion here). Remember those are median house prices cross-tabbed by year and Inner/Outer values. I live in Outer London, by the way. Is that why Outer prices are so much lower?